When it comes to your wedding, you want your big day to be magical but unfortunately, the vast majority of us don't have unlimited budgets. As you begin planning your wedding, you will quickly realize that going over your budget is easier than you thought. This is why we have put together a few easy budget-saving tips that you can implement into your big day! It doesn't take having a big family for your guest list to grow quickly. Whether you're inviting your old elementary school teachers to please your mom or you find your list getting larger because you are inviting all of your extended family, cutting down your list can result in less stress and will also help you save money. You shouldn't feel obligated to invite anyone to your wedding; after all, it is your special day. Cut down on the food budget without cutting down on the food! 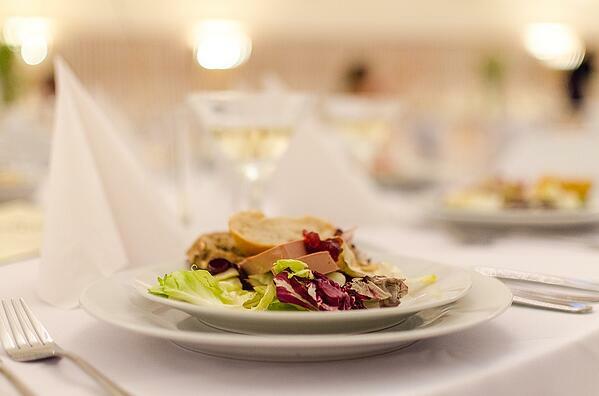 One of the most expensive aspects of your wedding is the food. It can be tempting to have a beautiful plated dinner but with the average plate per person costing $30-40, it can take up a big chunk of your budget if you are having a large wedding. Instead of offering a plated dinner, a family-style buffet can usually cut costs down by 20%. A buffet is more laid back and allows people to choose exactly what they want. If your family is full of great cooks, you could consider having everyone bring their favorite dish and hosting a potluck. This will drastically cut down on costs and when everyone brings their favorite dish you know the dinner will be great! Flowers may look beautiful but they also come with a high price-tag. Fortunately, there are a variety of other decorating options you can use for your wedding that end up being cheaper and are still beautiful! Try sticking to flowers for your bouquet only and using other elements like candles and fairy lights for your reception. If you still want to have floral centerpieces, try to stick to something smaller to save money. Floating flowers are also a unique trend that will wow everyone! If you're looking for a fun entertainment idea that will allow your guests to have a blast, a TapSnap photo booth checks all the boxes. Aside from being completely customizable to match your big day, your guests will receive unlimited lab-quality prints of their photos to take home. This eliminates the need for party favors and your guests will remember your wedding forever! For more information about TapSnap and what we do, you can check out our features page or check your date below!